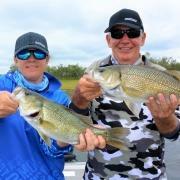 Storm build ups make the fishing in the South Burnett fun! The hot weather and afternoon storm buildups bring on some awesome oportunities for big bass and yellowbelly. With the onset of summer, this weather pattern is quite common and it really brings the native fish on the bite. If you’re an avid troller, from now through to February is the best time to dust off the deep divers and head to the South Burnetts dams to get amongst some great native trolling action. When the warmer months arrive and its hot, the yellowbelly and bass like to position themselves in a zone called the Thermocline, or comfortable water, which is generally a depth of 18 to 25 feet. This zone or column of water is the water that the fish find the most comfortable, where the temperature is just right to sit in while its hot upstairs and is full of the little critters that they love to gorge themselves on. With the majority of the fish sitting in this zone thoughout the dam, it opens up the doors for some fanstatic fishing opportunities. If I want to target bass, the first places I’ll look are the deep water off any prominent points. I’ll use my sounder to sound the fish sitting in that optimal depth. When I’m happy that I’ve found a good concentration of fish, I will pull up and begin casting 3” to 4” soft plastics rigged with a ½ ounce or 5/8 ounce head. With a big long cast over the areas that I found the fish, I will let the jig head sink 7 to 10 seconds and begin a slow retrieve back to the boat with a couple of twitches mixed in. The same can be done with a 12 or 18 gram Norries spoon. Continue this technique untill you start to feel a few taps on the plastic or spoon, when you feel a tap its important to keep that slow wind going unitll you feel weight on the line, slowly lift the rod tip until you feel the weight of the fish. At this point the fish will know its hooked and make some great runs back down into the deeper water. Keep your drag fairly loose so that the hook doesn’t pull on the way back to the boat. 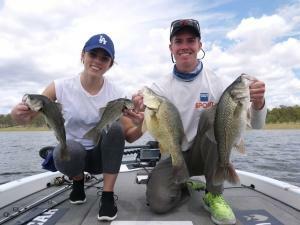 Using this method over the holiday period will account for some big bass on Boondooma. Craig and Rob had a cracking day on charter, throwing spoons to bass positioned in 20 feet. The timbered arms are holding good numbers of bass and yellow belly as well. In the arms they are holding very close to structure and you’ll need to get your lures in as close as you can to get a bite. Look for spindly timber, or big trees out in the middle of the arms. Lures of choice for this scenario are, 5/8 or 3/8 Bassman Spinner baits, ½ ounce jig head rigged with a 3” soft plastic and any sinking lipless Crank bait. Give your lure up to 5 seconds to sink down and start a slow wind. It’s important to make sure that you have a lure retriever with you as you WILL get snagged on the trees occasionally but if you’re getting snagged you know you’re in the thick of it. Fishing close to structure, I use 14 to 20 pound leaders so I have a chance if a fish rubs the line through trees. Otherwise, if I’m in open water I’ll decrease my leader size to 6 to 10 pound as I’m less concerned about a fish dragging me through trees or any structure. The sunsets on Boondooma are sensational, there’s not many ways better to finish a day, then like this. Trollers are picking up some great bass and yellow belly trolling around the deeper sections of the dam, targeting those suspended fish. Make sure to have plenty of deep divers handy, and some 5/8 Bassman Spinnerbaits or any lures that dive 15 to 20 feet will be the ones that get you onto consistent fish. Bait fisherman are consistently getting amongst a mixed bag of fish up in the timbered arms of the dam using worms and fresh shrimp. It may even pay to move to the main basin and let your bait suspend under the boat in that 15 to 25 foot range. 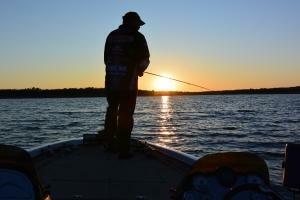 Drifting with the wind is a great way to cover water with your bait under the boat. Eventually it will cross paths with a hungry fish or two. 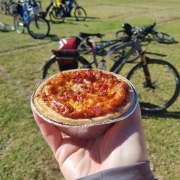 Red claw numbers are also starting to pick up with the hot weather, so make sure your pack the opera houses if you’re coming out for a day or two. 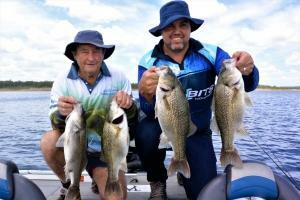 With a similar pattern to that of Boondooma, Lake Barambah is producing some great fishing as well. The fish are sitting in that 15 to 20 foot range and are very willing to take anything that is placed in front of them. 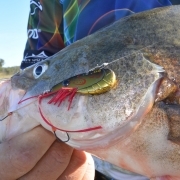 Because Barambah is a shallower dam you can target more areas and use a bigger variety of lures to catch a few natives. The Bass are responding well to 3” soft plastics, ¼ blades and 3/8 and 5/8 spinnerbaits. Some likely areas to target is the large flat area in front of the main dam wall, the Quarry and wide off Bass point. On a recent fishing charter, we targeted the lakes bass with a ½ jig head rigged with a 3’ soft plastic and caught dozens of bass and yellow belly. We targeted areas that were 15 to 20 feet and had rocky edges or a drop offs adjacent to them. I found that the bigger fish were tight to the drop-offs, and waiting for bait to swim over. Areas like this are prime ambush positions for native fish so don’t forget to give areas like this a go next time you’re out. 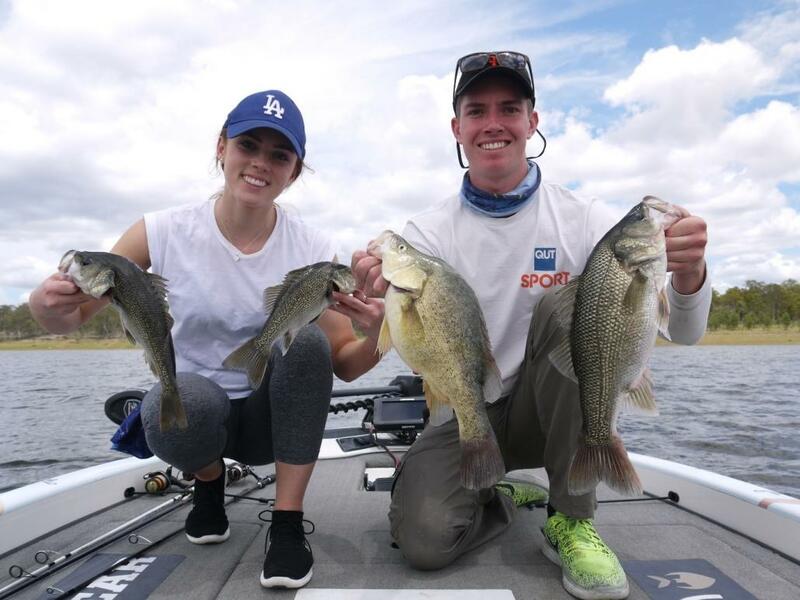 Maddie and Lane with a nice variety of fish on a recent charter to BP dam. 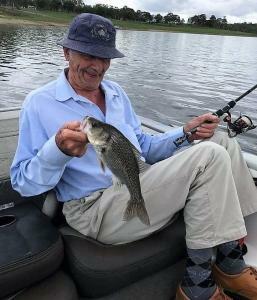 82 year old Bep had a great day on BP catching a few bass on 3 inch plastics rigged on a ½ ounce jig head. Trollers are catching some nice bass and yellow belly trolling over the quarry towards the dam wall as well as adjacent to the steep rock wall on the left of the dam just before bass point. Bait fisherman are consistently catching good numbers of yellow belly and bass anchoring along the steeper edges of the dam. Best baits have been fresh shrimp and worms. Red claw are patchy but I have heard of some good numbers coming from the dam. The fish stocking for both dams is still very much alive and well with another massive stock of bass put into Bjelke-Petersen dam this weekend. 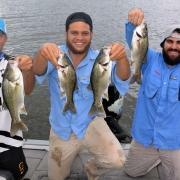 56 000 Australian bass were released into BP dam. 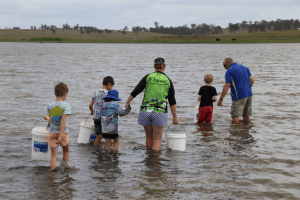 Boondooma Stocking Association also released 82 000 bass into Boondooma a couple weeks ago, so it’s a great boost for fishing in the South Burnett. It’s great to see our stocking associations working hard to make this happen because without them we don’t get to catch the fish that we really love chasing. 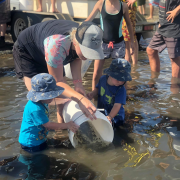 Members of the BP stocking group and a group of eager young helpers release Australian Bass into BP. 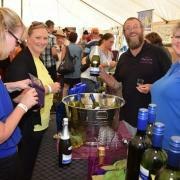 Don’t forget to book your site for the New Year’s celebrations at Boondooma dam, this year’s fireworks display will be a cracker. And to top it off when you get to enjoy your holiday with great fishing, water sports and beautiful sunsets, I reckon you would be mad not to come out and enjoy your break. On a final note, I have just started up my fishing charter business on BP and Boondooma dams. If you’d like a great day out and all the info and knowledge to catch Bass or Yellow belly in our two great dams make sure you give me, Matthew Langford a call on 0408658592 and I’ll be happy to take you out for a great days fishing. 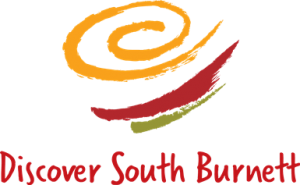 https://www.discoversouthburnett.com.au/wp-content/uploads/2017/12/fishing-Report-Dec-3.jpg 1034 1379 Stacey Perrett https://www.discoversouthburnett.com.au/wp-content/uploads/2018/01/Discover-South-Burnett-RESIZE-300x185.png Stacey Perrett2017-12-04 00:06:292019-01-07 12:59:07Storm build ups make the fishing in the South Burnett fun! Summer fishing at it’s best in the South Burnett! 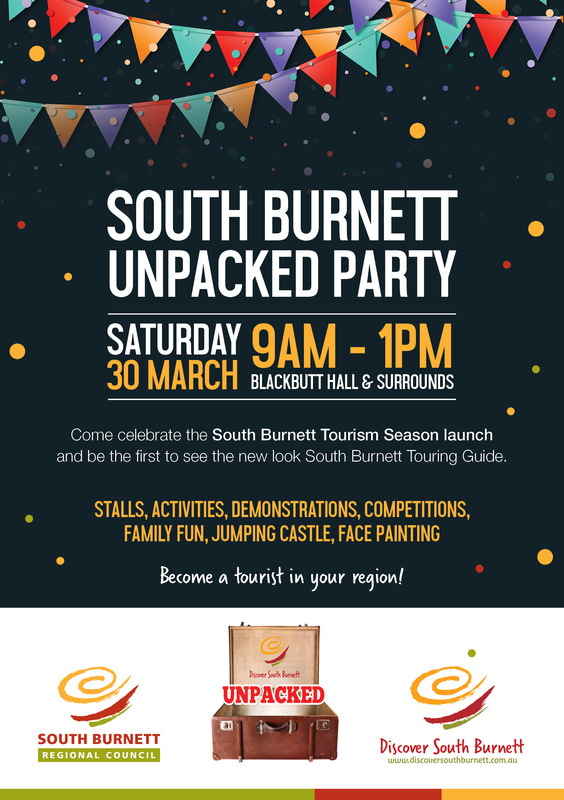 Water inflow a boost for the dams in the South Burnett! 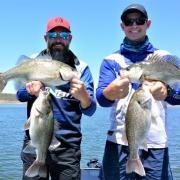 Fantastic freshwater fishing for the festive season. Spring heat brings the big fish out! Nothing beats the Great Outdoors!